Disclaimer: This preview is based on a free copy provided by Positech Games. Many people have probably heard of Gratuitous Space Battles (GSB) and the accompanying expansions. Did you know that the gratuitous battles are making their way to planet Earth? Even though I never got beyond the demo for GSB, I always appreciated the name. These are battles just for the heck of it. There isn’t any base building or resource harvesting, just bullets, lasers and death. What if WWI never ended, and instead of being limited to bolt-action rifles and machine guns there were mechs, lasers and shields (oh my). The bolt-action rifle and machine guns are still there, but I imagine they have been improved somewhat since almost 200 years have passed. Gratuitous Tank Battles (GTB) takes you to this alternate history. GTB is basically a tower defense game that allows players to customize their units and lets the players go on the attack. There are online components, such as recording challenges for other players, sharing user-created maps, and an in-game messaging system to communicate with your fellow players. I got the impression that GTB is feature complete (it is a beta build), and that balancing and bug fixes are the focus of remaining changes. The manual does a nice job describing how to perform tasks within GTB, while injecting bits of humor and back story. The humor does add a little bulk to the manual that doesn’t directly contribute to learning the game, but not too much. It’s a matter of personal preference whether you like some personality added to your game documentation. While I never felt lost after reading the manual, I do feel it could have covered some of the combat calculations in detail, which I’ll get to later. An in-game tutorial also exists to introduce players to the game who don’t wish to read the manual. The first time each screen is visited, some helpful text is displayed introducing the screen components and can get the impatient player into the game fairly quickly. The tutorial is mostly just text boxes, with the occasional press this or that. A fairly short linked-scenario campaign exists. User-created maps and challenges can be downloaded within the game to increase the overall content. Virtually all of the scenarios can be played as the attacker or defender. For added variety the user can play against a scripted AI, or let the AI adapt to your game play and have freedom to choose its own units. This is a nice feature for those players who wish to play scenarios multiple times with different strategies, while the scripted AI lets players try to crack the same nut multiple times until they are satisfied with their performance. There are 3 difficulty levels when playing against the non-scripted AI and I found the default to be a good challenge. Writing a preview for GTB presented me with a proverbial chicken and the egg problem. Which comes first, designing units or fighting battles? Personally I jumped into the battles and used the premade units to start, but I can imagine tinkerers going straight into unit design. Unit design provides a natural place to discuss the characteristics of units, so that’s where we will go. Units come in 4 different types (turrets, mechs, tanks, and infantry). Turrets are stationary buildings (think towers). Mechs and tanks are machine-based mobile units, while infantry are person-based mobile units. 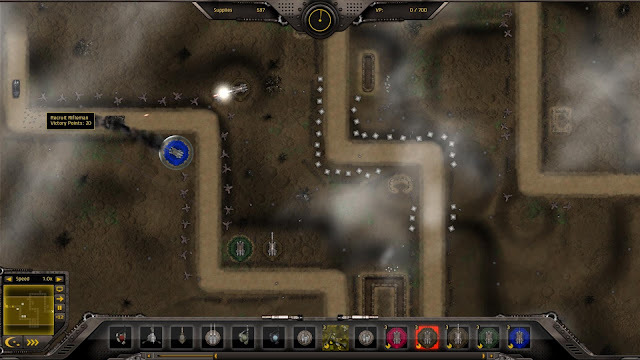 Turrets and infantry are used in defensive scenarios, while any of the mobile units may be deployed when attacking. The starting point of any unit is its hull, which define the components that may be placed on the unit. While turrets, tanks, and mechs share many of the same components, there are many that are not available to all hulls. Hulls also come in small, medium and large varieties too, so while a medium tank hull has 1 defense slot, a heavy tank has 2. Many hulls also have three flavors varying by cost and weight, allowing you to reduce the weight while paying a greater price when you deploy the unit in battle. After selecting the hull it is time to trick out your war machine with a variety of components. 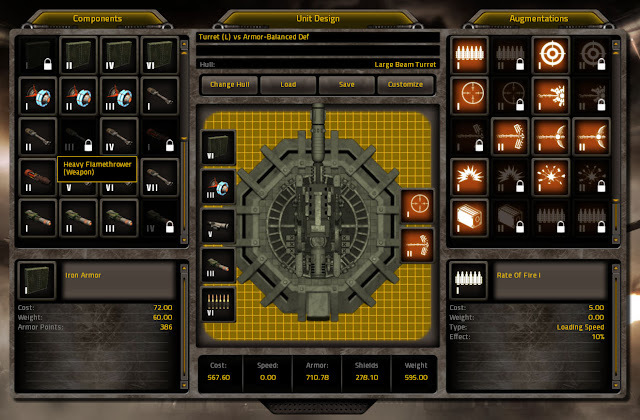 There are weapons (how to destroy the enemy), defense (for saving your hide), target acquisition (better accuracy), loaders (how fast ammo is reloaded), propulsion (how fast your units move), and augmentations (give bonuses to your unit in a variety of categories). Typically the different grades of components in the same category just give greater bonuses at a larger cost and possibly a different weight. Weapons are more complex and have a variety of statistics. Damage, range, rate of fire, effectiveness vs. armor / shields / tanks / mechs / infantry / turrets, ammo capacity, and reload rate differentiate the weapons that can be equipped on your designs. Out of all the different hulls I examined, I didn’t see any that had multiple weapon slots. The effect is that a unit will have a useful attack against armor or shields, but not both. It’s not difficult to discern the effect of most of the weapon attributes and you can get a pretty good idea of the firepower based on the damage, fire interval and accuracy. It is more difficult to judge how much of an effect the range will have on a unit’s effectiveness. Weight becomes a factor when playing attacking scenarios, as a heavy unit is a slow unit. Different grades of propulsion systems can help mitigate the weight of heavier designs, but in general heavy units are slower than light ones. There are also a variety of cosmetic customizations those so inclined can perform to tweak the look of their units. I practically never bother doing this in any game as I generally don’t care, but I did find it useful to modify the color based on what type of unit my design should be effective against. This technique makes deploying a unit in battle a more efficient affair, as when I saw a bunch of shielded mechs striding down the path I would build one of my blue turrets. As the player completes battles, more hulls and components are unlocked. Unfortunately, the stats of the components are not displayed when it comes time to choose an item to unlock. Some information would definitely be welcome. GTB starts with many items already unlocked, so new players still have many equipment choices. I found it weird that in some cases the more advanced component was available before the less advanced one (i.e. Armor Penetration 2 was available before Armor Penetration 1). Perhaps this is just due to the beta status of the game. Creating new unit designs is a very easy process, either by starting from an existing design or from scratch. Select a hull, drag and drop components, and let the killing begin! Now that your arsenal is designed, it is time to wage war. I started with the 8 scenario campaign and played through to the end as the defender in a couple sittings. The player must obtain victory in the scenario to unlock subsequent ones. The goal for the attacker in any scenario is to get enough of his troops to the exit point(s) before time runs out. Each type of unit is worth a different amount of victory points, with infantry and supply trucks being the most valuable. The defender wins if he can prevent the attacker from reaching the goal. Each scenario has its own victory point and time limits, along with separate supply rates for each side which will be discussed later. Like most tower defense games, units can only be deployed at predefined locations. There are generally many places to choose from, but you don’t get free reign. On offense you only have a handful of choices at the predefined starting area(s). Supply is the currency of war in GTB and is used to purchase units. Each side has an initial supply allotment to deploy units before the timer starts to count down, but the player doesn’t know what the opponent has deployed until the timer starts. Once the battle begins in earnest, each side accumulates more supply at the rate defined in the scenario, which could favor one side over the other. New units can be deployed as your supply balance allows. One additional constraint is that different unit types have limits. For example, only 4 large turrets can sit in your inventory at a time. Once a unit is deployed, the inventory will slowly increase back to the maximum amount. The UI does a good job at letting the user know how many units of each type are ready for deployment. Turrets take time to build depending on their resource cost, while other troop types are deployed immediately. Since only turrets and infantry are allowed on defense, I frequently used infantry as a stopgap measure when the enemy breached my more solid defenses. This isn’t a good habit to get into as infantry seems more expensive for the amount of firepower they provide. It is odd, but turrets are more versatile in that they can be decommissioned for a partial refund, but infantry must stay in place once deployed. There are also support units that provide a bonus to units in range, such as repairing or healing units and increasing their rate of fire. Mobile versions of these are available for the attacker. They do add a nice strategic choice – build more units or improve the ones I already have. - Keep an eye on new enemy units and build defenses to counter them. - Determine where to build new units. Since they take time to build you want to deploy to where the enemy will be, not where they are now. - Spend supply now or save for something better. When on offense, your units march down the path from the starting point(s) to the ending point(s), while engaging the enemy on the way. When provided with multiple paths, they will try to choose the less dangerous one, but an alert commander can give a particular path priority. To be honest, I only played a couple of the scenarios as the attacker. I didn't feel compelled to play more as I express 'In The End'. After the battle finishes, detailed reports are available to determine how units performed during the battle. In theory, by examining the battle report an astute commander should be able to determine where they can improve. I have successfully played many tower defense type games (Defense Grid, Anomaly Warzone Earth, Unstoppable Gorg, etc…) and could always determine where I needed to improve when I failed during a scenario. For some reason, this eludes me in GTB. Most scenarios I beat within a couple tries, but I believe there were 2 in the campaign where I beat my head against the wall because I had no idea why I was failing. I was losing fairly quickly and just couldn’t determine what I needed to change to be successful. I eventually made it with some trial and error, but it was rather frustrating. Several people have commented that Unstoppable Gorg was difficult, and there were some scenarios that game me trouble, but I could always figure out where I went wrong (i.e. – I couldn’t handle the speedy units or have the firepower to take out the tough ones.). If you decide you can’t get enough of GTB, you are in luck. The game ships with a custom map editor, that allows you to, well, create custom maps. I did some minor editing of an existing map and within a couple minutes I was easily able to edit the available paths the attacker can take, modify the terrain graphics, and designate tiles as defensive deployment areas. I didn’t see anywhere within the editor to limit the valid unit designs for the scenario, but from examining the stock scenarios it looked like it could be done by creating some text files and putting them in a folder within your scenario. The online map / challenge browser is pretty friendly too. Players can rate each submitted challenge for fun and difficulty, so it shouldn’t be too tricky to find the ones worth playing. This should add a lot of replay value for fans of the game. Controls are straight-forward throughout, with options to perform them with the mouse or keyboard. As a whole I have no complaints about the UI as it is well-done, so I will mention the areas that don’t keep up with this standard. In general controls were responsive, but when zoomed in the mouse wheel zoomed back out much slower than I expected. This only seemed to occur when zoomed in pretty tightly. Another slight annoyance was that the slider button in the scroll bars didn’t always respond when I would click and drag them. Since the game is still in beta hopefully these issues can be addressed. The available unit designs are in a horizontal scrollable list at the bottom of the screen. Unless you really differentiate similar designs it can be tedious to find them in the list. It would be helpful to have filters to reduce the list, such as only show units with laser weapons. Another option could be to let the user hide the unit for that scenario, or to disable it in the unit designer without deleting it. The panel that this list is on can also block the action, so the player can’t see what is going on. The panel can be hidden to reveal what is below, but then the player loses access to building units. I would prefer a stationary panel, but restrict the viewing area to above this panel. GTB makes a great first impression. The bold logo in the middle of the screen, surrounded by cool drifting smoke really sets the mood for some futuristic warfare. Inside the game proper I wasn’t as impressed, but the visuals are not bad by any means. The animations also provide some useful feedback, such as shields lighting up when taking damage. Music is fairly typical and somewhat repetitive. It could be right at home in a movie like The Rock. Guns make appropriate sounds. Nothing was bad, but didn’t knock my socks off either. Other than a couple minor issues that I would expect to be corrected by release, the game performed flawlessly without any crashes or hiccups. One error I encountered in the last build was corrected in the latest one. Gratuitous Tank Battles puts me in an awkward spot. On the surface it appears to have the features that would combine to make for a fun game, but I had to force myself to play through the campaign. I’m at a loss because there isn’t an obvious problem I found with the game. The combat was hectic and challenging at times, but uninteresting. The player has a lot of choices when designing his units, but I didn’t feel compelled to do any more than I had to. If there were some truly unique and interesting abilities to design units with, the unit customization could have been an interesting aspect to the game play. In the end it’s essentially just rock, paper scissors – lasers beat armor, ballistics beat shields, machine guns and flamethrowers beat infantry. There is a little more than that, but nothing that really elevated it to the next level for me. I prefer the clearly delineated units in other tower defense games to creating my own variations. My guess is that fans of this series would not agree with me. Even though I have a lot of experience playing tower defense and strategy games, there was an odd disconnect in my brain between the result of the battle and how I got there. Again, I am unsure why as I read the manual and understood the mechanics of the game. Perhaps part of my lack of enjoyment is that inside the game, none of the character that was narrated in the manual shown through. Defense Grid and Unstoppable Gorg oozed character through their alien pores. I don’t really play strategy games for the story, but an enjoyable narrative can take a good game and ratchet up the entertainment value. It does bother me to be this negative about a game that I only have vague objections to, but I know when I’m having fun and it just wasn’t happening. That being said, I do think it is an improvement over Gratuitous Space Battles, which was even more of a black box to me. My guess is that if you liked GSB, you will like Gratuitous Tank Battles (perhaps even more). I do think GTB has the potential to pull in a wider audience too. The support from Cliff at Positech has been outstanding, and even though GTB is not for me I wish him much success and I hope my opinion is in the minority. As a former software developer I enjoy seeing developers like Cliff succeed.